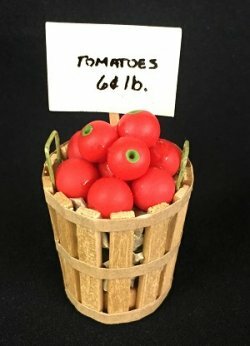 This farmer's market bushel of tomatoes comes in a wooden container with green metal handles. It is busselling over the top with vine ripe red juicy tomatoes that are priced at 6 cents a pound. It measures approximately 2" tall to the top of the sign and 1" in diameter.